“Einstein's heyday coincided with the birth of quantum mechanics, and the stories of his debates with physicist Niels Bohr over the theory's counterintuitive and probabilistic predictions are legendary. "God does not play dice with the universe," he is famously reported to have said. 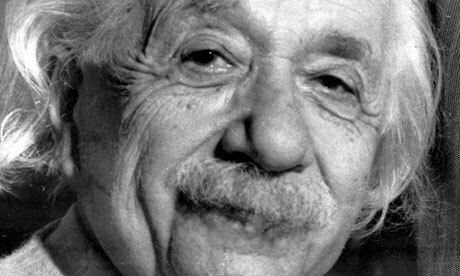 …Einstein was well aware of the need to understand the quantum realm. And, in his quest to understand and explain general relativity, he sought to understand how gravity performed in his epic theory when it was applied to the world of the supersmall. The result can be summarized in three words: It failed badly. Our friend Albert is dancing in Spirit right now, because we have succeeded: we have built that bridge between the macroscale and the microscale phenomena of our universe! After about six years of intensive research and collaboration, we discovered that using the ultimately smallest quantum unit, which we call the Triadic Rotational Unit of Equivalence (TRUE), a third form of the substance of reality was found to be necessary for any stable sub-atomic structure to exist. When the elementary particles of physical reality: electrons, photons, quarks, protons and neutrons were analyzed using TRUE units, suddenly, all of the patterns of atomic structure and the natural elements of the Periodic Table were clearly explained! The most amazing thing that we discovered was the fact that the most stable TRUE unit structures were the elements and molecules of life, and no stable structures could form without the proper mix of mass, energy and gimmel! Intelligent life is no accident. It was built in from the beginning. The necessary mix of mass, energy and gimmel was, and is, determined by the mathematical, hyper-geometrical structure of space, time and consciousness. This structure is described by a set of equations we call the Conveyance Equations. The forms of these equations conveying the logical structure of higher dimensions into the physical universe include the Pythagorean theorem, Fermat's famous Last Theorem, and the forms that govern the combination of quarks in threes and the resulting forms of all of the atoms from Hydrogen on, and all the stable forms of the universe. Can you rephrase please? If English is not your first language, please repeat your comment in your own language. Thanks.